To Shed Pounds, Going Vegetarian Or Vegan May Help : The Salt A meta-analysis found that people on vegetarian diets lost around 4.4 pounds more than the control group who had no change in diet. Those who tried a vegan diet dropped 5.5 pounds more. A meta-analysis found that people on vegetarian diets lost around 4.4 pounds more than the control group (who had no change in diet), while those who went vegan dropped 5.5 pounds more. Most people go vegetarian out of some combination of ethical, environmental or health concerns. But to drop pounds? That could soon become another reason to go meatless. A meta-analysis published in early July shows that people who followed a vegetarian diet overall lost more weight than people on an average American diet. Previous research has linked vegetarian diets to decreased risk of type 2 diabetes and coronary heart disease. But there have been few big studies showing whether people can lose weight if they cut out the meat. So a group of researchers affiliated with Harvard University's T. H. Chan School of Public Health combed through published clinical trials – nearly all of them small — that looked at the effects of vegetarian diets on weight loss. The team focused on two major types of vegetarian diets: the lacto-ovo diet, which allows for milk and eggs, and the vegan diet, which is typically plant-based with no animal products at all. The researchers started with 1,513 studies and narrowed them down to 12 that met their criteria. The studies had to be original, randomized controlled trials that looked solely at vegan or lacto-ovo-vegetarian diets. They also had to compare them with non-vegetarian diets and evaluate the resulting changes in body weight. The 12 clinical trials selected involved about 1,100 subjects ranging from 18 to 82 years old, some of them obese or diabetic. The follow-up periods across the 12 trials ranged from eight weeks to two years. "Vegetarian diets have been suggested as one of many dietary approaches to promote weight loss because of high amounts of plant-based foods, but evidence is limited and inconclusive," Frank Hu, professor of nutrition and epidemiology at Harvard and an author of the study, tells The Salt. "We aimed to get a better picture about the effects of vegetarian diets on body weight." The results of the meta-analysis, published in Journal of General Internal Medicine, found that those on vegetarian diets lost around 4.4 pounds more than the control group (who had no change in diet), while those on a vegan diet dropped 5.5 pounds more. The Mediterranean-style DASH diet, which is based on studies by the National Institutes of Health, has come out on top in many recent diet rankings. Another popular plant-based diet is the Ornish diet. Low in refined carbs and fat, the Ornish diet ranked first for heart health. And as Allison Aubrey has reported, low-carb diets are increasingly outperforming low-fat diets in clinical trials. According to Hu, none of the studies analyzed in his paper did a head-to-head comparison of vegetarian diets with other diets. "So we can't conclude that vegetarian diets are superior to either low-fat or low-carb diets in terms of weight loss," Hu says. "What we can conclude is that compared to average American diets, vegetarian diets appear to confer some benefits in the amounts of weight loss, especially within a short time [less than a year]." A possible reason for weight loss may be the large amount of fruits, vegetables and whole grains consumed by the people on the vegetarian diet, according to the researchers. These foods are all high in fiber – a factor associated with lower body weight, they write. In addition, plant-based foods usually have fewer calories and more nutrients than animal-based foods, Lydia Bazzano, an associate professor of epidemiology at Tulane University, tells The Salt in an email. But as Bazzano, who was not involved with the study, notes, this isn't the last word on how to diet to lose weight. This study only looked at clinical trials, which "represent more of an idealized setting than most people encounter in their daily lives." "Patients [recruited for clinical trials] receive more support than when they're on their own," Bazzano says, "There are usually recipes, guidelines, multiple meetings with dieticians and follow-up measurements. If you're switching to a vegetarian diet for weight loss you might not get that." You also have to stick with the diet of your choice, Hu says. 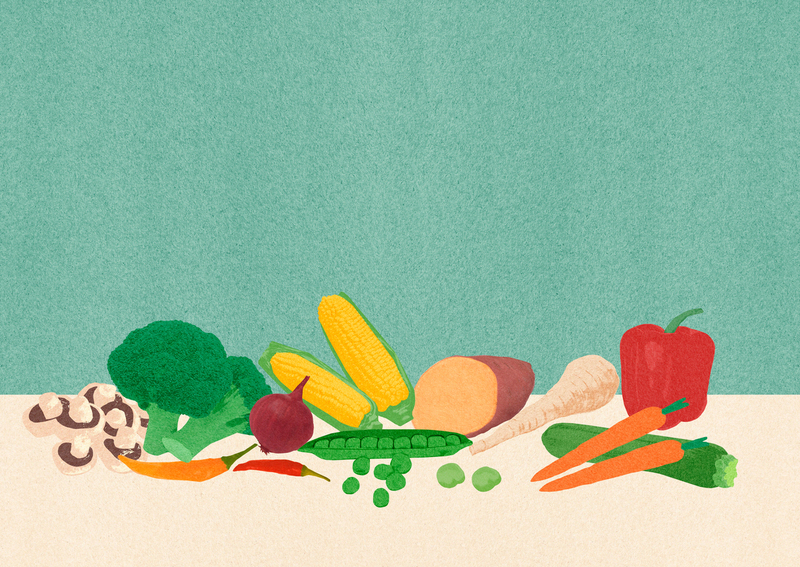 Studies show how a vegetarian diet or DASH diet helps with weight loss in the short term, but, he says, "whether these diets can help individuals control their weight in the long run will largely depend on individuals' adherence to these diets." And, of course, eliminating meat from your diet still doesn't mean the pounds will necessarily shed themselves. "One can consume a fattening, unhealthy diet whether vegan, vegetarian, or omnivore," says Bazzano. A vegetarian or vegan could still be eating too many "refined grains or added sugar, which both contributes to obesity and poor health outcomes."